Enjoy all the Bay of Islands has to offer or simply relax and enjoy the views from this near-new home! •	Stunning water views with privacy. •	Modern, comfortable and well-equipped. •	No extra charges for linen or cleaning. Free WiFi. •	Hear kiwi calling at night and watch weka by day. This near-new, spacious holiday home is set on a large, private site only 3km from Russell Village. It’s close to shops, restaurants, cafes and beaches but feels a long way from the holiday crowds. “Kiwi Heights” is the perfect getaway for couples or families with children over 5 years old. Enjoy all that Russell and the Bay of Islands has to offer or simply relax and enjoy the view! There are expansive water views from the bedrooms, living areas and large decks. The sunny, open plan living area includes a well-equipped kitchen and there is a gas BBQ if you want to cook outside. The window seat is the perfect place to relax with a book, listen to music or just take in the scenery. You can plug in your laptop and connect to free wifi in the office alcove. Kiwi Heights sleeps 4 people in 2 bedrooms - both with water views. The master bedroom has a king-size bed. The other bedroom can be made up with a king-size bed or 2 single beds. The second bedroom is available to groups of two only by prior arrangement. All linen is professionally laundered. For winter, there is a wood-burning fire in the lounge. Make use of the attached double carport for undercover parking. This is a Kiwi Zone so you’ll be able to hear kiwi calling at night. We’re involved in kiwi conservation projects around Russell and aim to be environmentally sustainable; our appliances are water-efficient and low-energy, facilities for composting and recycling are provided. During your stay you can visit historic attractions in Russell, enjoy beautiful beaches or eat out at a range of cafes, restaurants and pubs. To explore the islands take a trip on one of the ferries, yachts or day-cruises that depart from the Russell Wharf. And it’s only a short ferry trip across the bay to Paihia and Waitangi. If you want to be active there's a selection of walking tracks nearby, including the Bay of Islands Walkway. You can cycle along the Opua rail trail or test your skills on the mountainbike tracks at Waitangi. E-bikes, kayaks and SUPs are all available for hire in Russell. If you fall in love with Kiwi Heights and want to stay for an extended period, please enquire about our rates for long stays. Kiwi Heights is not suitable for children under 6 years old because there's no handrail on the decks (which are 1m high). This is a “Kiwi Zone” so pets are not permitted. There is no extra charge for cleaning so we ask guests to leave the house tidy. Eion's family has lived in and around the Bay of Islands for 80 years and this is where we first met. We left Russell to study and travel before returning in 2012. We built "Kiwi Heights" ourselves and also run a small eco-tourism business called "Russell Nature Walks". We love living here surrounded by the sea, forests and bird-life. Stay in a kiwi zone - this is your chance to hear Kiwi calling at night. Enjoy stunning water views and privacy. Modern, copmfortabe and well-equipped. No extra charges for linen or cleaning. Free wifi. The toilet is separate from the bathroom. All bed linen is provided at no extra charge and is professionally laundered. Undercover parking for two vehicles in an attached carport. Living room with sofas and TV. Window seat with bean bags. Tea, coffee & sugar. Salt and pepper. Cooking oil. Coffee plunger (a.k.a. French press, caffitiere), crockery and cutlery, glassware, serving and mixing bowls, plasticware for picnics. Wrap-around decks with outdoor bean bags, picnic tables and a gas barbecue. 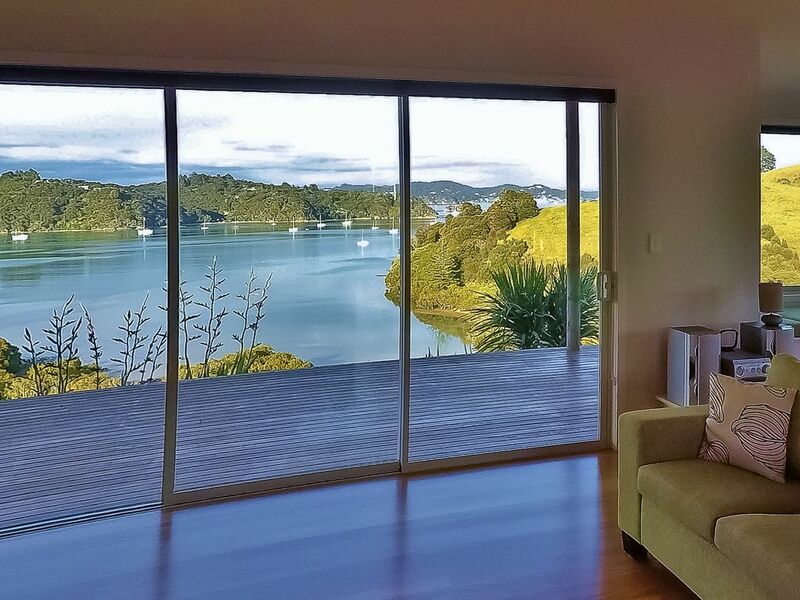 Kiwi Heights is a beautifully appointed spacious two bedroom home with a stunning view of the Bay of Islands. We thoroughly enjoyed our stay and found Lisette a most hospitable host with a wonderful knowledge of the surrounding natural environment. House was very tidy and well set out. Had everything you need to comfortably stay in the house with lots of outdoor seating to follow the sun. Amazing views from every room. A very comfortable bed and lovely/welcoming owners. Lisette has a lovely property that is very well maintained. The location is fab! The house was extremely clean.Bed was comfortable. Good shower.Beautiful views, with many birds around. Road noise was very disturbing from about 6 am to 10 pm. In the last 5 years we have spent 36 weeks touring NZ staying in rental homes and this was by far the least well supplied and equipped . We purchased toilet rolls, dishwasher powder and laundry detergent, which we have never needed to do in previous rentals . The guest acknowledges the house is “extremely clean, comfortable, good shower, beautiful views, with many birds”. Otherwise, the review and the 2-star rating is dishonest and misleading. The guests rented the house for an entire month and received a generous discount on the understanding that it would not be serviced or re-provisioned during the stay. However, at their request I provided them with alternative outdoor furniture (no easy task), made their bed and regularly supplied fresh linen to save them from washing it themselves. When they asked for a teapot they already knew I wasn't available because I had family commitments (and I bought a teapot later). I responded to all their requests and did my best to make their stay enjoyable despite his pompous and demanding behaviour. Happily, I've never had other guests behave this way and I continue to enjoy welcoming people from NZ and around the world. wonderful spacious house with a beautiful clear and light design. The house is absolut perfect equiped. We enjoyed our time! Thanks for your review and for leaving "Kiwi Heights" so clean and tidy. We're very happy you enjoyed your stay. We could not have asked for a better experience! Thanks for your wonderful review. If you do return to the Bay of Islands we would love to welcome you back at "Kiwi Heights".